I’m not a frozen food fan, but sometimes I want something that is quick and easy and cheap and frozen food is /it/. Today, for example, my original plan for dinner was to make Cajun jambalaya, but we went to the movies, and then to the supermarket, and then it was too late to cook (really, I can’t really make anything in less than an hour). So it was mac & cheese for the girls and a trip to Grocery Outlet for me, to see what was in the frozen food aisle. Alas, there weren’t too many choices that fit my palate. I had already tried Claim Jumper lasagna before – I’d found it edible. There was too much sweet sauce, too little cheese and meat, but while it’d never be my first choice, I could eat it again. Today I decided to try something else, the meatloaf. My expectations were low so I was pleasantly surprised to find the dish not just edible but satisfying. Now, I think that was because the food was super hot and I was very hungry, but I only eat frozen food when I’m really hungry :-). The meatloaf itself had a mild taste and a non-offensive texture, it smelled of liquid smoke but it didn’t have any overwhelming flavor. The mashed potatoes were light and the gravy non-offensive. The portion is definitely much smaller than the picture implies, but it was enough for dinner – and a reasonable 540 calories (though mostly coming from fat, some of that is probably in the gravy and you don’t need much of it). I’d this dinner again over the lasagna. Update: Today I tried the Claim Jumper fried chicken. Once again it looked like it wouldn’t be enough food for dinner, and once again I was wrong. The meal consisted of a breaded/fried boneless chicken patty, mashed potatoes & gravy & some corn in the cob. The chicken itself wasn’t that great. It had a weird flavor, similar to food fried in really old oil. The texture was fine, though. I did like the mashed potatoes, the fact that they were very hot helped. I didn’t try the gravy or the corn. I don’t think I’d buy this meal again. My biggest gripe with these meals is that they take too much work. If I’m going to have to eat frozen food, what I want to do is put the damn thing in the microwave, set the time and come back when it’s done. For the meatloaf, I had to remove the cover, add water to the green beans, recover, cook, come back, remove the cover, remove the meatloaves, stir the mashed potatoes, return the meatloaves, recover, cook some more, remove, pierce the gravy package, put it on a plate, microwave, open the package and pour it on the food. It may not sound like much, but if I have to do multiple things I might as well cook some pasta. 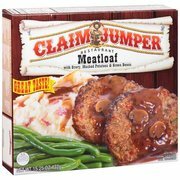 Claim Jumper dinners are $3 a Grocery Outlet, they’re about $4 at the supermarket.